Orbital Net was formed in 1996 by Darren Brown, our current Managing Director, and incorporated in 1998. Over that time we have grown into one of the largest ISPs in the south-east of England. We have grown steadily since our inception and continue to expand our network and product ranges to suit changing demands and advancing technologies. Orbital was born in 1998 as a partnership providing Domain Name registration and basic webhosting. The full extent of our network at this time was a single 42u Rack cabinet in Ashford, Kent housing our main Pentium 166MMX FreeBSD server along with banks of 28k modems enabling 'dial up' customers to connect. Our connectivity in 1996 was a kilostream leased line service running at 64k! Within a year we upgraded our leased line backhaul to 2Mbit, this was at that time classed as huge and we could not foresee a time 2Mbit could not cope! It soon became apparent in the .com boom around 1998/9 that expansion was required to keep up with demand, for this reason we moved to new premises which enabled us to house more staff and extra servers to cope with the thousands of domain registrations we were now doing. At this point we hosted around 2000 websites. In 1999, Orbital Net Limited was incorporated and we were on the move again to a larger premises. We built our own server room with connectivity back to Telehouse North via NTL and Cable and Wireless. These were a combination of bonded 2Mbit circuits and a single 45Mbit circuit. In this year we trialled our first commercially available wireless network to serve clients using Breezecom equipment running at 2.4ghz. We were able to surpass the typical ADSL speeds offered over phone lines which were a maximum of 2Mbit but more typically 512k. Our wireless solution could deliver 6Mbit which sounds like a poor connection now but was considered more than anyone could possibly need at the time. We joined RIPE and became an LIR (Local Internet registry) with our own IPV4 address allocation and the Autonomous System Number 24916, this enabled us to effectively make our network part of the Internet through peering. As our customer base built strongly on the products we offered, both wired and wireless, we were in a position to expand our Kent network. This included renting our own fibre circuits to form a ring around Kent, this meant we did not have to rely on Leased Line providers to deliver our connectivity to the internet. Our core network started in Telehouse North where, in a single year, our rack count increased from 1 to 8. In this year we started peering with other Internet Providers at peering points including Linx, LoNap and Lipex. 2006 was an amazing year for Orbital and a huge boost to our Company as a whole. As our wireless network was growing, other Companies were also building similar networks in Kent. We were in the fortunate position to be able to purchase the network of our biggest competitor (Telabria / SoBroadband) and consolidate their network into our own. The residential part of their customer base was sold to Vfast Limited and, along with Orbital Net Ltd, is still owned by our parent company. This was another big year for expansion, with our larger customer base, we had the need to purchase a third office to house our sister Company Vfast and two members of staff from Orbital were also relocated to the new Canterbury Office. Our backbone infrastructure continued to grow, both in Fibre and Wireless across Kent, West Kent was now a big focus in our expansion with a newly built PoP in Tunbridge Wells serving outskirt area's like Eridge Green. In 2011, it was becoming apparent that working from separate offices was not the most efficient way of serving our customers, we decided to buy a large Building on the outskirts of Canterbury which is our current Head office. We performed a major refit on the building creating an inspiring work environment for our staff. In this year we started the planning of our next phase of expansion led by Ben Doherty, our Technical Director. We were aware that as BDUK issued funding to BT to roll out FTTC/P to the whole country, the market in both Fixed Wireless and Leased Lines would change. It was decided that we would un-bundle BT Telephone exchanges with our own racks across Kent to offer bespoke services to our clients. Ben guided Orbital through the vast 'onboarding' process and our first exchange went live in late 2013. This exchange was Canterbury and was shortly followed by Ashford and Maidstone. This new infrastructure enabled us to offer generic GEA services but also niche products with diverse WiMax failover. This was something we believe has given us the competitive edge and is something nobody else can offer in Kent. 2015 saw the completion of our two-year exchange rollout project, Orbital completed over 90% coverage of enabled FTTC cabinets in Kent. This year was also a record year for the sign up of new Fibre Leased Line customers, we believe this is due to the competitive pricing we are able to offer due to having network to the local exchanges in major towns across the South East. In 2015 Openreach announced they will be switching off the traditional ISDN network by 2025, since this news we have invested heavily in our own Hosted VoIP solution. We created this solution in house and now have VoIP specialists in our employ to support a smooth transition for customers switching to this feature rich service. This year saw the time for some refurbishment of the outside of our head office building and also an entirely new website. As our product ranges increase more customers are looking for information to help them navigate what can be a very technical process. We have introduced clear and helpful advice on each of our products to simplify and educate customers enabling them to select the right services for their business. 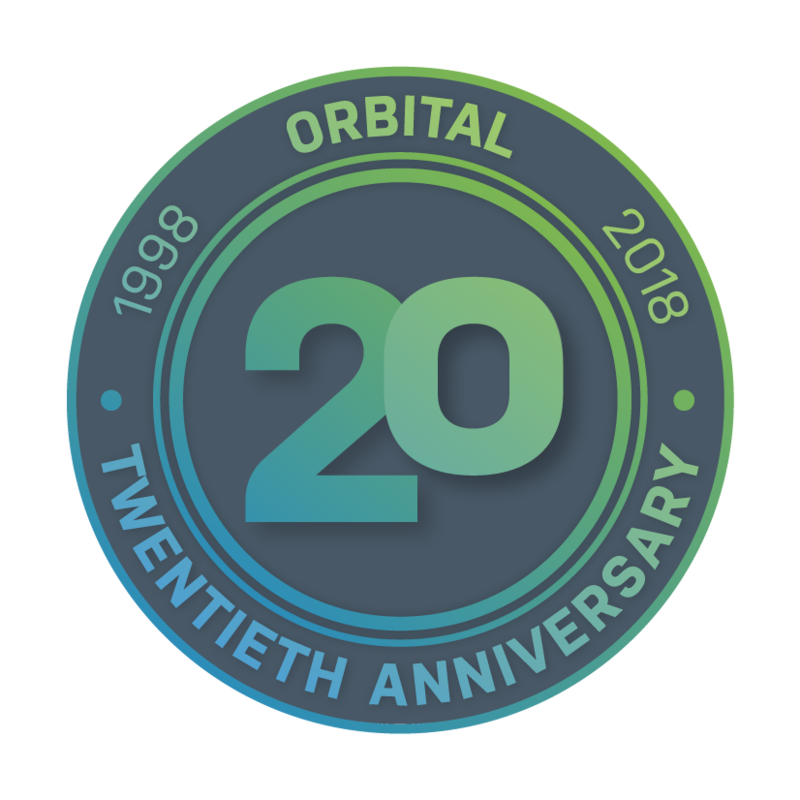 Orbital are proud to announce that 2018 is our 20th year of operation. We have experienced more expansion this year including adding to our existing solutions and account management teams, this will enable us to continue offering the same level of support to our increasing customer base. After our refurb of the outside of our building last year, this year we started work on building new offices at the back of our building to house our larger work force. 2018 has been a year of massive change for Orbital, we have continued to invest in our existing network infrastructure and further expanded it, allowing us to reach even more customers who have previously suffered with poor connectivity options.